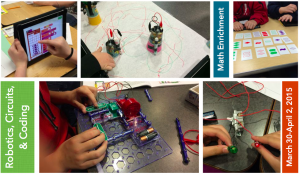 Sign up now for Spring Break Enrichment Classes! During the week of spring break (March 30-April 2), four enrichment classes will be offered to 2nd-6th graders at Westside Community Schools. All classes will be held at Westgate Elementary at 7802 Hascall St. Click on the flier below to find class descriptions and times. Classes are limited to 20 students so sign up today! Is there a waiting list for robotics is there is a cancellation, 2nd grade? Thanks for the comment Susanne. We are working on getting a 2nd class offered.